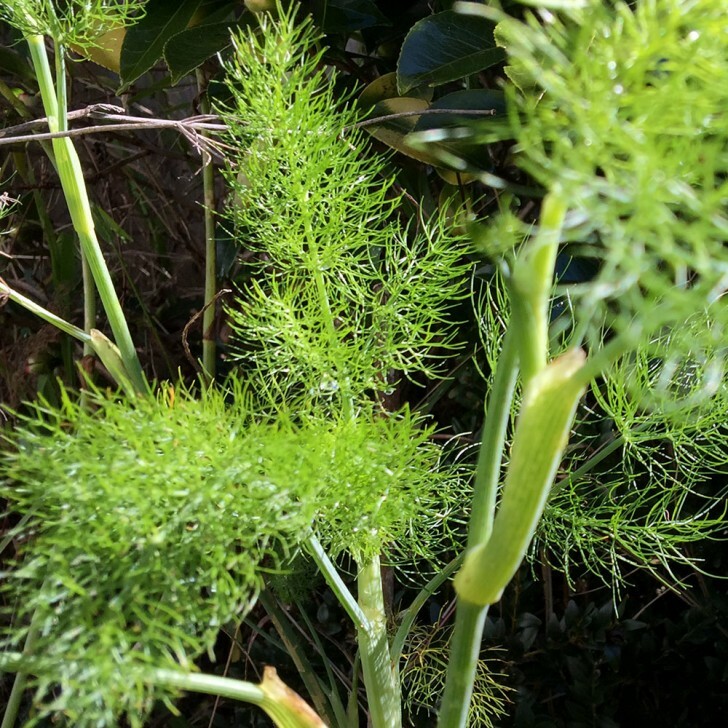 Fennel – Foeniculum vulgare – is a versatile perennial herb or harvested vegetable. It can be used in a number of ways in savoury or sweet dishes. And it has a fairly long usable growing period if you count the seeds, leaf and a base bulb. There are basically two main types – ones that get fat bulbs and ones that don’t. However there is a lot of natural variation in shape, size and ability to bulb that I have seen. The bronze coloured version is another obvious example. The leaf is always useful as a decoration due it’s fine feathery look and it’s nice hit of aniseed like flavour. This goes especially well on desserts with vanilla and subtle flavoured long cooked meat or vegetable dishes where you want a fresh licorice like clean ‘tang’ added to complement or lift the dish. The seed is easy to collect and makes for a good addition to dishes like you would fenugreek, anise or dill seed. Very nice on dishes with Cumin seeds as well and an excellent addition to the crust of breads or rolls. It is also excellent as a compliment to blanched chicory and other bitter greens. I find fennel has pretty good germination rates and grows fairly easily and this is also illustrated by it’s weed status in many parts of the world. Regular collecting of the seeds for edible use can help with this weed issue. If you harvest for the bulbs obviously you will not get seed from them. The trick is getting it to create the giant succulent bulbs. I have found this comes down to a combination of both the seed variety selection and it’s soil growing conditions. Lots of water during the main growing stage helps a lot and full sun with a thick mulch helps too. If you get a period of hot weather it will go to seed quickly especially if it’s also dry. And don’t let them get too bug or they get kinda tough. I find the best are only about 2-3cm through and you should have not much of an issue getting batch to get to this size in cool weather. I grow several varieties in pots and in the ground. Because they are perennial you can always have a nice solid bit of leaf available for adding to a dish. Blending it into a paste with olive oil and other herby additions also works well as a dressing for pasta and spread toasty bread with some nice shaved parmesan.